GENERAL DESCRIPTION SPACIOUS, WELL PROPORTIONED & BEAUTIFULLY PRESENTED MODERN Brick Built END TOWN HOUSE ** THREE BEDROOMS (TWO DOUBLE, ONE with FITTED WARDROBES plus LARGE SINGLE) ** HIGH QUALITY CONTEMPORARY DECOR THROUGHOUT ** LAMINATE FLOORING ** STYLISH LIVING ROOM with FEATURE FIREPLACE & FRENCH DOORS to TERRACE ** SEPARATE DINING AREA, OPEN PLAN to LARGE MODERN FITTED PEARWOOD STYLE BREAKFAST KITCHEN with STAINLESS STEEL OVEN & HOB ** CERAMIC TILED MODERN WHITE SHELL DESIGN BATHROOM with ELECTRIC SHOWER over CORNER BATH ** White uPVC DIAMOND LEADED DOUBLE GLAZING ** Gas CENTRAL HEATING ** SECURITY ALARM ** ENCLOSED LOW MAINTENANCE THREE TIERED PATIO & DECKING TERRACE GARDEN with SOUTHERLY ASPECT ** OPEN WOODED OUTLOOK ** RESIDENTIAL CUL DE SAC LOCATION ** COBBLED PARKING BAYS ** CONVENIENT for LOCAL AMENITIES & COMMUTING to LEEDS & BRADFORD. This delightful and well-presented home will be of particular interest to first times buyers, families and professional couples seeking generously proportioned, ready to move into accommodation with a charming garden in an advantageous location. LIVING ROOM 11′ 4" x 10′ 3" (3.45m x 3.12m) max White uPVC double glazed diamond leaded french doors with matching full height sidelights to front enclosed decking and patio garden. Central heating radiator. Feature cream modern fireplace with polished marble insert and hearth. Decorative brass style coal effect electric fan fire. Sky digital / cable / TV aerial points. Light neutral decor and co-ordinating deep neutral accent decor to chimney breast. Fan design contoured ceiling. Feature egg and dart moulded plaster ceiling cornice with decorative corner pieces. Varnished moulded pine skirting boards and door architraves. Beech style laminate flooring. Georgian style panelled stained pine door to dining area. DINING AREA 9′ 11" x 7′ 11" (3.02m x 2.41m) max White uPVC double glazed front entrance door with decorative patterned and coloured leaded lights with tulip motif. White uPVC double glazed diamond leaded window to front. Central heating radiator. Telephone / broadband internet point. Co-ordinating light neutral and vertical stripe accent decor. Fan design contoured ceiling. Moulded skirting boards. Maple style laminate flooring. Georgian style panelled white door to living room. Open plan to breakfast kitchen. BREAKFAST KITCHEN 13′ 9" x 8′ 3" (4.19m x 2.51m) max Modern pearwood shaker style fitted wall and base units including: cutlery drawer and pan drawers; open display shelving; feature long brushed nickel handles; wine rack; moulded cornices and pelmets. Light grey granite effect round edged worktops and server peninsula / three seater breakfast bar. Mosaic effect ceramic tiled splashbacks. Stainless steel single drainer sink with chromed mixer tap. Stainless steel four ring gas hob with vented extractors and light over in feature stainless steel canopy hood. Stainless steel electric double oven and grill (lower oven fan assisted). Space for fridge and freezer below worktops. Plumbing for automatic washing machine and automatic dishwasher. Wall mounted gas central heating boiler concealed in matching cupboard. Central heating radiator. Light neutral decor to match dining area. Fan design contoured ceiling. Riven stone effect ceramic tiled floor with feature decorative tiled border and ‘diamond’ set centre field. White uPVC double glazed diamond leaded window to rear with tiled sill. Open plan to dining area. Georgian style panelled white door to rear entrance hall. REAR ENTRANCE HALL 9′ 7" x 9′ 4" (2.92m x 2.84m) max White UPVC double glazed patterned and diamond leaded rear entrance door. Co-ordinating light and deep modern decor with cathedral style feature panels to dado. Moulded dado rail and skirting boards. Mahogany woodgrain effect vinyl flooring. Deep understairs storage area with space for tumble dryer. Coat hooks. Georgian style panelled white door to breakfast kitchen. Access to first floor staircase. N.B. there is potential to extend the rear hall into the exterior store rooms and open porch to create a third reception area measuring approx. 11’8" x 9’7" max. (subject to necessary building regulation / planning approval). RETURN STAIRCASE AND HALF LANDING 5′ 9" x 2′ 10" (1.75m x 0.86m) Central heating radiator concealed in slatted cabinet to half landing. Co-ordinating light and deep modern decor with cathedral style feature panels to match rear entrance hall. Feature wave design mirrored wall. White balustrade with globe topped newel posts to return staircase. 1ST FLOOR LANDING 11′ 11" x 5′ 9" (3.63m x 1.75m) max L-shaped. Co-ordinating light and deep modern decor with cathedral style feature panels to match reception hall and staircase. Moulded dado rail. Fitted linen storage cupboard with panelled white door and housing foam lagged immersion heater . Access to illuminated loft with potential for further development (subject to necessary building regulation /planning approval). Georgian style panelled white wood grain effect doors to three bedrooms and bathroom. DOUBLE BEDROOM 1 14′ 9" x 8′ 8" (4.5m x 2.64m) White uPVC double glazed diamond leaded window to front. Central heating radiator. Two fitted double wardrobes with Georgian style curtained glazed and white panelled doors. Twin two drawer bedside pedestals with glazed display shelving and storage cupboards over. Illuminated canopy with recessed brass style halogen downlighters and moulded cornice. Space for bedroom furniture. Co-ordinating bright and modern decor. Ceiling coving. Moulded dado rail. Georgian style panelled white woodgrain effect door to landing. 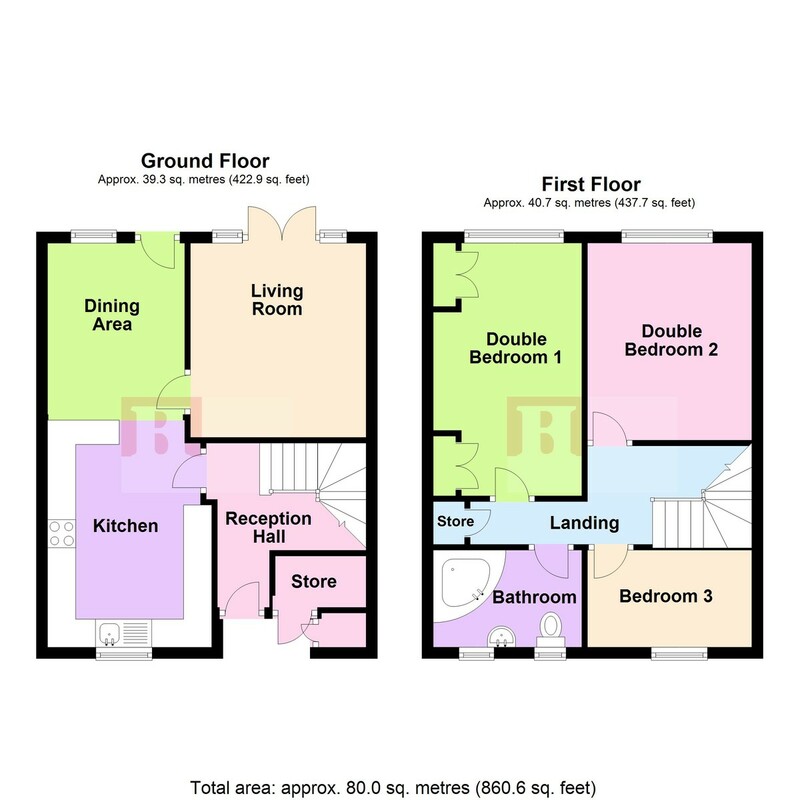 DOUBLE BEDROOM 2 11′ 6" x 9′ 7" (3.51m x 2.92m) White uPVC double glazed diamond leaded window to front. Central heating radiator. Cable point. Space for wardrobes and bedroom furniture. Contemporary light grey neutral decor. Georgian style panelled white woodgrain effect door to landing with window over for borrowed light. BEDROOM 3 9′ 7" x 5′ 8" (2.92m x 1.73m) A large single bedroom, presently used as an office. White uPVC double glazed diamond leaded window to rear with white uPVC sill. Central heating radiator. Space for bedroom furniture. Co-ordinating metallic silver and deep neutral decor with decorative border. Beech style laminate flooring. Georgian style panelled white woodgrain effect door to landing. BATHROOM 8′ 7" x 5′ 7" (2.62m x 1.7m) max Modern white three piece shell design bathroom suite with Victorian brass style fittings. Large panelled corner bath with seat, electric shower over and shower curtain rail. Pedestal wash hand basin with tiled splashback. Close coupled WC with soft closure pine style seat and tiled boxed pipe work. Central heating radiator. Co-ordinating marbled effect ceramic tiled walls with decorative tiled border and feature tiles. Chequerboard ceramic tiled floor. Two white uPVC double glazed patterned and diamond leaded windows to rear with tiled sills and reveals. Georgian style panelled white woodgrain effect door to landing. EXTERIOR REAR Shared tarmac pedestrian access paths with shared lawned area to side. Lawned garden to rear. Flagged path and steps to open entrance porch with courtesy light, bin storage cupboard and exterior storeroom with potential for further development as an expanded rear reception room (see above) or study, guest WC, etc. 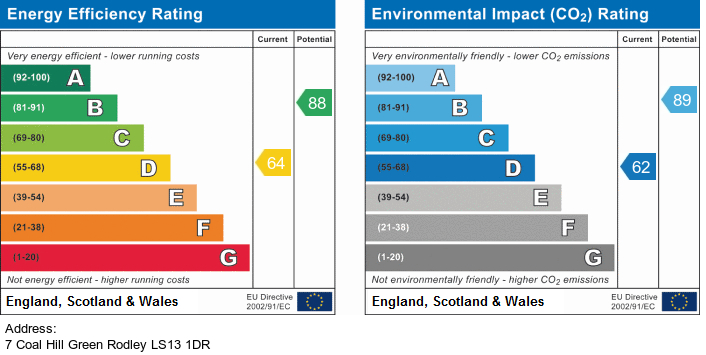 (subject to necessary building regulation / planning approval). EXTERIOR FRONT Enclosed low maintenance three tiered patio decking and terrace garden with french doors to living room and southerly aspect. Riven stone effect flagged patio with well stocked raised timber edged floral and shrubbery borders. Inclined flagged patio terrace / path (suitable for disabled access) with well stocked waved edged shrubbery border, feature conifers and mature berberis border. Raised decking terrace with decorative metal wave balustrade and globe topped newel posts. Security sensor light. Open wooded outlook. Tall wood paling fencing and braced wood paling pedestrian gate. The property is situated in a residential cul de sac location with mature trees, shared cobbled parking bays and additional on street parking to the front. White uPVC double glazed diamond leaded french doors with matching full height sidelights to front enclosed decking and patio garden. Central heating radiator. Feature cream modern fireplace with polished marble insert and hearth. Decorative brass style coal effect electric fan fire. Sky digital / cable / TV aerial points. Light neutral decor and co-ordinating deep neutral accent decor to chimney breast. Fan design contoured ceiling. Feature egg and dart moulded plaster ceiling cornice with decorative corner pieces. Varnished moulded pine skirting boards and door architraves. Beech style laminate flooring. Georgian style panelled stained pine door to dining area. White uPVC double glazed front entrance door with decorative patterned and coloured leaded lights with tulip motif. White uPVC double glazed diamond leaded window to front. Central heating radiator. Telephone / broadband internet point. Co-ordinating light neutral and vertical stripe accent decor. Fan design contoured ceiling. Moulded skirting boards. Maple style laminate flooring. Georgian style panelled white door to living room. Open plan to breakfast kitchen. Modern pearwood shaker style fitted wall and base units including: cutlery drawer and pan drawers; open display shelving; feature long brushed nickel handles; wine rack; moulded cornices and pelmets. Light grey granite effect round edged worktops and server peninsula / three seater breakfast bar. Mosaic effect ceramic tiled splashbacks. Stainless steel single drainer sink with chromed mixer tap. Stainless steel four ring gas hob with vented extractors and light over in feature stainless steel canopy hood. Stainless steel electric double oven and grill (lower oven fan assisted). Space for fridge and freezer below worktops. Plumbing for automatic washing machine and automatic dishwasher. Wall mounted gas central heating boiler concealed in matching cupboard. Central heating radiator. Light neutral decor to match dining area. Fan design contoured ceiling. Riven stone effect ceramic tiled floor with feature decorative tiled border and 'diamond' set centre field. White uPVC double glazed diamond leaded window to rear with tiled sill. Open plan to dining area. Georgian style panelled white door to rear entrance hall. White UPVC double glazed patterned and diamond leaded rear entrance door. Co-ordinating light and deep modern decor with cathedral style feature panels to dado. Moulded dado rail and skirting boards. Mahogany woodgrain effect vinyl flooring. Deep understairs storage area with space for tumble dryer. Coat hooks. Georgian style panelled white door to breakfast kitchen. Access to first floor staircase. N.B. there is potential to extend the rear hall into the exterior store rooms and open porch to create a third reception area measuring approx. 11'8" x 9'7" max. (subject to necessary building regulation / planning approval). Central heating radiator concealed in slatted cabinet to half landing. Co-ordinating light and deep modern decor with cathedral style feature panels to match rear entrance hall. Feature wave design mirrored wall. White balustrade with globe topped newel posts to return staircase. L-shaped. Co-ordinating light and deep modern decor with cathedral style feature panels to match reception hall and staircase. Moulded dado rail. Fitted linen storage cupboard with panelled white door and housing foam lagged immersion heater . Access to illuminated loft with potential for further development (subject to necessary building regulation /planning approval). Georgian style panelled white wood grain effect doors to three bedrooms and bathroom. White uPVC double glazed diamond leaded window to front. Central heating radiator. Two fitted double wardrobes with Georgian style curtained glazed and white panelled doors. Twin two drawer bedside pedestals with glazed display shelving and storage cupboards over. Illuminated canopy with recessed brass style halogen downlighters and moulded cornice. Space for bedroom furniture. Co-ordinating bright and modern decor. Ceiling coving. Moulded dado rail. Georgian style panelled white woodgrain effect door to landing. White uPVC double glazed diamond leaded window to front. Central heating radiator. Cable point. Space for wardrobes and bedroom furniture. Contemporary light grey neutral decor. Georgian style panelled white woodgrain effect door to landing with window over for borrowed light. A large single bedroom, presently used as an office. White uPVC double glazed diamond leaded window to rear with white uPVC sill. Central heating radiator. Space for bedroom furniture. Co-ordinating metallic silver and deep neutral decor with decorative border. Beech style laminate flooring. Georgian style panelled white woodgrain effect door to landing. Modern white three piece shell design bathroom suite with Victorian brass style fittings. Large panelled corner bath with seat, electric shower over and shower curtain rail. Pedestal wash hand basin with tiled splashback. Close coupled WC with soft closure pine style seat and tiled boxed pipe work. Central heating radiator. Co-ordinating marbled effect ceramic tiled walls with decorative tiled border and feature tiles. Chequerboard ceramic tiled floor. Two white uPVC double glazed patterned and diamond leaded windows to rear with tiled sills and reveals. Georgian style panelled white woodgrain effect door to landing.